Neurocutaneous syndromes (NCSs) are a well-recognized cause of neurological dysfunction in children. 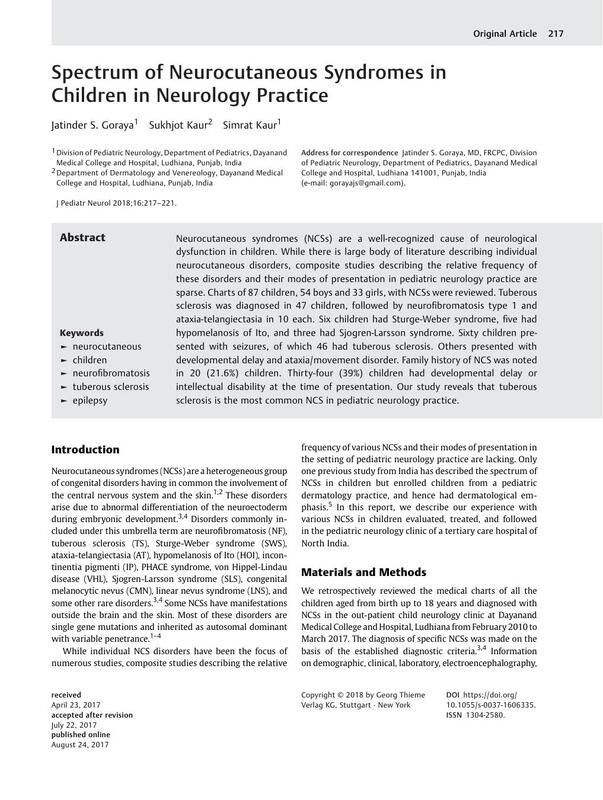 While there is large body of literature describing individual neurocutaneous disorders, composite studies describing the relative frequency of these disorders and their modes of presentation in pediatric neurology practice are sparse. Charts of 87 children, 54 boys and 33 girls, with NCSs were reviewed. Tuberous sclerosis was diagnosed in 47 children, followed by neurofibromatosis type 1 and ataxia-telangiectasia in 10 each. Six children had Sturge-Weber syndrome, five had hypomelanosis of Ito, and three had Sjogren-Larsson syndrome. Sixty children presented with seizures, of which 46 had tuberous sclerosis. Others presented with developmental delay and ataxia/movement disorder. Family history of NCS was noted in 20 (21.6%) children. Thirty-four (39%) children had developmental delay or intellectual disability at the time of presentation. Our study reveals that tuberous sclerosis is the most common NCS in pediatric neurology practice. J.S.G. conceptualized the study, reviewed the literature, and wrote the initial draft. S.K. (Sukhjot Kaur) reviewed the relevant dermatological literature and critically revised the manuscript. S.K. (Simrat Kaur) compiled and analyzed the data and also reviewed the manuscript. All authors approved the final manuscript as submitted and agree to be accountable for all aspects of the work.